We have been using the facility for a few months. It was handy, clean, had helpful tools and elevator and was easy to use. suggestions would be lights in the units and a more reasonable price point. 24 hour access and no trash laying around. Staff was also very friendly!! I've utilized a number of storage companies over the years, but this is by far my best experience. The units are well maintained and the entire facility is kept in clean, working order. The staff, especially the on-site manager (Mike), are very friendly, attentive, and knowledgable. I'll be returning to Stop-N-Go for my future storage needs, and will certainly be recommending them to friends and family. Finally moving out of Westerville Mini Storage after keeping our stuff their for a year. One of the nicest facilities my wife and I have stored at. Alexis and Mike were professional and helpful in helping us pick out a unit and supplies. If I need another garage again it'll be here! Called in to follow up on a requested receipt that we were told would be emailed to us the previous day. The girl who answered the phone was huffing and puffing throughout the entire conversation and acting like she didn't have time for my call. She was very short, exasperated and snippy. She was irritated when she asked the company name and said she found it under an employee name. However, the invoice clearly shows our company name as I stated it and the employee as the "care of". She then re-emailed the receipt before I could asked if she could confirm the spelling and got very rude when I did. I had to literally tell her that I'm sorry I was an inconvenience and that the email address was indeed spelled wrong. When I thanked her after she corrected the spelling and re-emailed, all I got in return was Yep and a hang up. No I'm sorry, thank you or even goodbye. I understand people have bad days but there is no need for rudeness to someone not being rude in the first place. I have only been using this storage facility for a little over a month now and have gotten nothing but respect and courtesy from the staff here ! Absolutely recommend! Everyone is always pleasant and I have had no problems. I would say that the review is Excellent. Great place to store items! CHEAP! This is my first experience putting my items into storage. I decided to move overseas for a year and I couldn't have made a better choice than storing my belongings at Westerville Mini Storage! They have the best price in Westerville (and Columbus) and have ample amounts of space in their units. The staff is very friendly and helpful. 24/7 access to your unit and it's right off the highway so it's easily accessible. Thank you Westerville Mini Storage! Westerville Mini Storage was a great choice when I needed a small unit to hold some things before I move. The price was the best in the Westerville area and it is located on State St. just off the 270 exit, so it is easily accessible even to people who might live a little out of the city. The property is very secure and the rental process was simple. The girl working that day offered me a heavy duty dolly to make moving a washer and dryer easy, giving me immediate satisfaction with their customer service. Great experience! I like the security and pricing.Also, the staff was friendly. Driving down Westerville Rd, there are several options to choose from and I visited them all. What set Westerville Mini Storage apart, they were actually open when they said they were open. At 2:45pm on a weekday, there was a human being there working and eager to assist me. That is why they got my business. I am not interested in pulling up, seeing a sign at 2:45pm that says you will return at 5pm and you close at 6pm. Thanks for being open as advertised. Staff are very friendly and helpful. Units are accessible 24/7 and are clean. It's also the cheapest of the storage facilities in that area. Highly recommended. Staff is very helpful. Units have high ceilings and very clean atmosphere. Wheeled carts are available to make moving your storage items very easy. Great price and highly recommend. The facility is so clean and safe! As a single mom who needs to tuck some things away for a short period of time, I have no hesitation to go there by myself and move stuff in. It is also clean - - can a storage facility be clean? Staff is kind and thoughtful too! Good location and Good price! The customer service at Westerville Mini Storage was excellent. The process was quick and informative, i was able to move in my unit in minutes. My unit was clean and the area is secure. I'm definitely of Westerville Mini Storage. Ryan are friendly guy, the storage are clean and got plenty of room for my stuff. Customer service are great too. Love it! This is the best place i have ever been. Ryan and his crew are great!!! They have been very friendly and helpful every time i have been there. I love how secure and clean this facility is. I really like how nice and helpful the staff are. It's also a very clean and safe storage place. Very satisfied! Clean, safe and in a great location! The staff was friendly and very helpful. The facility is safe and in a convenient location. We feel that we made a great choice renting here. I've use this facility before and came back again when I needed some storage space. I feel very confident with security and the availability to enter my storage unit whenever I desire. This is a very nice storage facility clean and reasonablely priced. Well managed and very nice staff. I highly recommend this storage facility. You will be very happy you did. When looking for a storage unit we found this business to be the most affordable in the area and the staff to be helpful. The units were clean and set up well. Friendly staff and great prices. I highly recommend this storage facility. Westerville Mini Storage is the best storage facility that I've encountered. It's very clean, conveniently located and the staff is very friendly. Returning customer. Facility is clean, well maintained. Great staff. Staff is excellent! Secure, clean and great prices. I like the convenient location & affordable rates. A small moving truck is available for use. I would recommend. Recently rented a 10'x10' interior and the customer service was professional and extremely nice. Great location close to I-270 and OH-161 off of OH-3. Excellent security features. Free use of a moving truck is extremely helpful. The place is well kept, very clean, and the storage unit area is excellent. Great prices compared to some of the other storage facilities in the area. Thanks! Signing up is easy and a good value. Great customer service. Very friendly and knowledgeable staff. Help us pick out the right storage unit for our needs. Nice clean facilities, and easy to get a unit. friendly staff, best rate, moving truck a great resource. No other facility can touch this storage company. I will refer everyone I know to them. I rented from Westerville Mini Storage for about a year and a half, and I have nothing but positive things to say about my experience with them. The staff was always helpful, and their prices are more than reasonable for what you're getting. Fast easy process. Great rates. Friendly staff. With several options nearby, this was a no-brainer. I had a wonderful experience with Westerville Mini Storage. I had a wonderful experience with Westerville Mini Storage. Their customer service is excellent, the facility is very clean and I love our climate controlled storage unit. I would reccomend Westervile Mini Storage to my family and friends! I have been here almost a year. I have a climate controlled unit and the building is always spotless. I feel safe going there and highly recommend Westerville Mini Storage if you need a place to store extra belongings. Wonderful from start to finish, to say the least. Renting a storage unit at Westerville Mini Storage was one of the easiest things I dealt with during my move. They let me contract the rental mostly by fax so I didn't have to leave the office, had a truck I could borrow to move my larger items, and even called me when they noticed my lock was gone within hours from the time I emptied my storage unit. They reached out to me about the security of my unit even before I made it to my new home! I truly can't say enough wonderful things about my experience. I highly recommend their service. The staff were very helpful the day I signed up for a unit. I had to change the size after already signing up and they were very accommodating. They had everything all ready when the movers arrived. First few years were great and then change of personnel. Desk people are so rude, why I have no idea. Not helpful with anything needed to move out of unit. Would never give this place a recommendation. Glad to be out. First of all, thank you for voicing your recent concerns regarding your tenancy at Westerville Mini Storage. We appreciate your feedback, and will use what we have learned in an effort to improve our business standards in the future. The care and satisfaction our customers receive is held in the highest regard by our employees and owners. We understand that moving is a very stressful endeavor, and we felt we went above and beyond to allow you the extra time to vacate your unit, without being charged for another month. Westerville Mini Storage is convenient, clean and well maintained with very courteous staff. I recommend it to any one in the vicinity! I had a great experience with mini storage. I moved from a larger 10x20 to a 10x10. They were very nice and got me a new spot just four spaces away from my original and charged me the lower price immediately. They were nice about informing me of a rule that I did not know about and cleared up my problem in a timely manner. I recommend them over the larger public storage to everyone who has a unit, have converted my mom! very satisfied with the unit I have. people very nice and helpful. would recommend this storage facility to everyone. This facility is very clean and helpful. I recently rented a storage unit from Westerville Mini Storage. I read reviews before I rented. And the reviews were right. The location is clean - the staff is exceptionally nice and helpful - I was able to use the truck for free with the size of unit I purchased and the units have alarms. I would recommend this location to anyone! Helpful staff helped us figure out what size we would need and they worked to make sure we had the best experience possible. the staff is very friendly. the prices are competitive and they even give you a free truck for the first day. the alarms on the units make me feel like my stuff is secure. Friendly and accommodating staff. Facilities are clean and well maintained. I have no worries about storing my household belongings here. I would recommend to friends. Very nice and clean. Good secure facility!!! It is a great storage facility and everyone i have met here is wonderful, polite and helpful. Especially when i first came from Akron, ohio to have a place to put my things safely and securely. Satisfying on all aspects: fair rates, clean, availability, costumer service, and security. 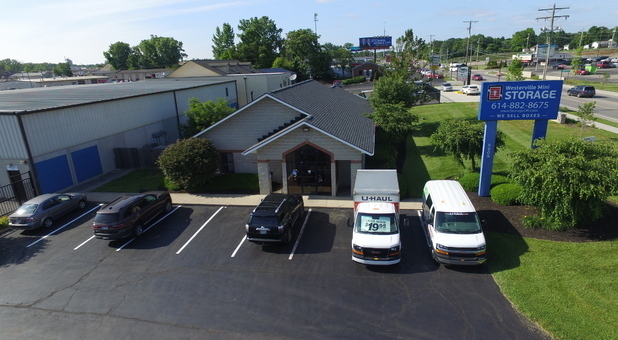 I've been a customer of Westerville Mini Storage for several years and I have been very happy with the them. . Bob is helpful and accommodating. I would STRONGLY recommend Westerville Mini Storage. Great place, safe, always helpful, nice staff. I have only been at Westerville Mini Storage for a couple months, but it is a relief to not have to worry about my things. The staff is great. I truly appreciate the ladies at this storage facility, I love the reminder calls and the emailed receipts. You ladies are wonderful.. Thank you for making this a wonderful place to store " My Life Memories"
This storage facility has been great! The complimentary move-in truck made it extremely convenient to transfer my overflow items. The climate-controlled option has kept all of my temperature-sensitive items in good condition. The facility is safe and secure and simply meets all of my storage needs. Excellent customer service has almost become a thing of the past. We consumers have grown accustomed to outsourced customer service departments and faceless, electronic "help." It always gives me a bit of hope when a company actually goes above and beyond the call of duty and provides excellent customer facilities, service and support. We always recommended Westerville Mini-Storage to our friends. Have never had a single problem, day or night, service at the front desk has always been prompt and polite. Very helpful when answering phone calls as well. Great service! We like the indoor storage which is clean and the temp is always controlled. We have been a customer since 2007. We live in ID so our only contact is by email or phone. Everyone has been courteous and quick to respond anytime we have had a question. We have actually recommended Westerville Mini-Storage to a couple of friends still in OH. MY PARENTS AND I HAVE BEEN RENTING FROM THIS LOCATION ON AND OFF FOR OVER 15 YEARS. WE GET NOTHING BUT THE BEST SERVICE FROM EVERYONE THERE. IF WE KNOW OF ANYONE LOOKING FOR STORAGE WE ALWAYS TELL THEM ABOUT WESTERVILLE MINI. Having my company based across country I really appreciate the ease of working eletronically with Westerville Mini Storage. Great people in the office. Very Secure facility and great location. I would just like to say that Bob and the entire team over at this storage facility are a very caring and amazing group of people, they go above and beyond to make sure that their customers are satisfied. If you have a problem they work diligently with you until there is a resolution. I have been a customer there for going on two years. I have never had any problems nor is there any worries for me as far as security. I feel very confident in leaving my most precious possessions in the very capable hands. I would recommend this storage facility to all my friends and family or anyone else that is in need of such service. Thank you Jenniffer Ploeger. Always friendly staff, site is clean, and the unit alarms give me piece of mind. Highly recommended. The level of service I have received from the Westerville office has been nothing less than world class. I am the director for a service and support division and I would hire any of your staff member in a minute. They are friendly, courteous and knowledgeable. Kudos to your team members. I love it!! Great staff! No rodents or bugs! clean, CLEAN units. Amazing pretty lot, clean units! I was a previous tenant and I had a "good stay". So much so that I recommended my cousin who was also satisfied. When this need arose, I never considered another facility. We are very satisfied with the facility. The staff are very polite. As customers we feel safe with our personal belonging being at the facility! Very friendly and efficient check in process. Great facility. Great price for my unit. The customer service went above and beyond! She made sure I had step by step details about the unit sizes(how much would fit), best entry way for drop off and pick up, and later about the vacate date rules. This was awesome to find so close to home. I checked with 5 different storage facilities and got prices. But here at Westerville Mini storage not only was the price right but the staff was so efficient , courteous and professional. They even called me to let me know once that my door had not latched properly and I came right down to lock it up. Great place and great people spells success in my book! great price, very clean, secure and safe, staff are very friendly, will recommend to others for a great experience. I very great place to rent. Safe and priced really fair. I would use them again. Thank you so much for the good customer service Sharon! Property is always clean. Staff is very friendly. Very friendly and clean facility. Ive used this facility since last September, everyone is very friendly and it is convinent location. I also like that i can pay my bill Online makes it allot easier considering i work past hours. This is a very clean facility and the people are nice. I have been with Westerville Mini Storage for 7 years. Great experience, facility is well maintained. Friendly staff, fair prices, and a great place to store anything. I would like to thank Bob & Sharon for their warm welcome as a new leaser at Westerville Mini Storage. They both were very out going and very thorough with the information they gave. It was a quick and easy process that I like especially being pressed for time. Thanks to the office help, need more staff like them. Westerville Mini Storage was our first choice. We had rented there previously and we knew it to be a great location with excellent security. We also had easy access to our unit and we found our unit to be very Clean. The office people are friendly and helpful. I recommend Westerville MIni Storage to anyone looking for quick access to their storage. There are several sizes available to meet your storage needs and they offer specials and good pricing. Great property and great prices. Great prices and very helpful staff. The staff was most helpful with answering questions prior to our selecting a unit and with explaining the rental process. They were professional and thorough which made the sign-up process a breeze. excellent facility and service; Sandra was wonderful---very nice and helpful; would highly recommend to everyone who needs a storage unit; AAA+++ rating! The location is very reasonable for an Otterbein student. Thanks for the good service! The rates are very fair. I've never had an issue with the gate/gate code to get into the property which for me is potentially huge. Have been at a previous storage facility where it wouldn't be working four days a month. The staff also is very fair and kind to work with when a customer question arises! Recommend highly! Bob always greets with a smile, Alexis is always so kind,Sharon is always so helpful, and the new ones Joe and Sandra are great too. hey have great rates, 24 hour access which is great for us that can't make it there normal business hours.You can have UPS and Fed EX and other carriers deliver to you unit. Each unit individually alarmed, this is just a great place for your storage needs. What ever your needs even supplies Bob Alexis, Sharon, Joe , and Sandra will get the job done, I have been there about 10 years, and I plan on ten more!!!!! I would go no where else, love the climate contol building, it just what I needed. Contacted Sandra at Westerville Mini Storage in a bit of a panic since my daughter at freshman at Otterbein did not have a storage for all her stuff before coming back home to Oregon. Sandra was phenomenally helpful and when she did not know an answer she found out the answer while I was on the phone. I was able to get all the information I needed from her and the website to submit my lease and make my first month's payment in a matter of 2 hours. Loved the personal attention from Sandra and the exceptional customer experience I had with the business. Kudos on a great job! I know we will be use them next year as well! Very clean place to do business very freindly!